Can Teresa and Melissa just admit that they don’t like each other and move on? It’s painfully obvious that they would not be in the same room if they had the choice. Yes, they have family events to attend. But other than those, they pretty much hang out due to contractual obligation. But anyway, we will be treated to some more nonsensical shouting from Teresa. Melissa will also talk about her “third sister.” No one cares. I will never get over the absurdity of Melissa taking a genetic test after a psychic reading. A psychic reading that didn’t even go down on the show. She has no one to match with. Yet, she was just hoping a random person took a genetic test looking for her as well. Makes sense. Can she make up something at least a little realistic for next season’s storyline? And, of course, the ladies will talk about Jennifer Aydin’s incessant bragging. Again. Yes, there will be even more toilet talk about her Paramus mansion. Speaking of the mansion, Jackie Goldschneider and Jennifer talk about the article Jackie wrote based on her visit to Jennifer’s house. They will never agree about this. Again, let’s move on. Argue about something new. They really should have condensed this reunion down to two parts. We all know they’re saving the juicy stuff for the last episode. 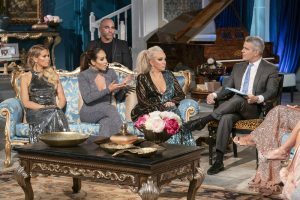 Change the channel to Bravo tonight at 9 PM to watch the Real Housewives of New Jersey reunion. Join us in the comments on this post to share your thoughts on the episode. Tweet us your thoughts and check us out on Instagram. And, of course, come back here tomorrow for our Real Housewives of New Jersey recap. And don’t forget to vote for us to win best reality TV website! TELL US- WILL TERESA AND MELISSA EVER BE GENUINE FRIENDS?